At the top of the list of people and beings I least want to disappoint are my parents, followed by the Duolingo owl. His name is Duo, and if I happen to skip a week of Japanese lessons, he appears in my inbox, crying in a pool of tears and begging for me to come back to the app. The developers at Duolingo know this email campaign works, because they’ve A/B tested several iterations of the crying owl, down to how many teardrops he sheds. Today, the company is launching its biggest redesign in five years, and Duo is at the forefront. Now the owl’s illustration has been simplified to make it easier to animate, and he’s been given a wide array of expressive emotions in hopes that users will become more attached to the mascot. He’ll even cry animated tears in your inbox now. “It’s so sad and pathetic :(,” a Duolingo spokesperson told me. Changing Duo’s design was a task that, according to Duolingo CEO and co-founder Luis von Ahn, ”opened up a Pandora’s Box” to change the rest of the app, so the entire interface has been overhauled with a blockier, more cartoony design. Laying out every screen in the app side by side, the design team noticed inconsistencies that had piled up through years of development and testing — von Ahn estimates the app to have about 200 different screens. The goal was to unify all these different pages with a new design language that allowed for significantly more animation. 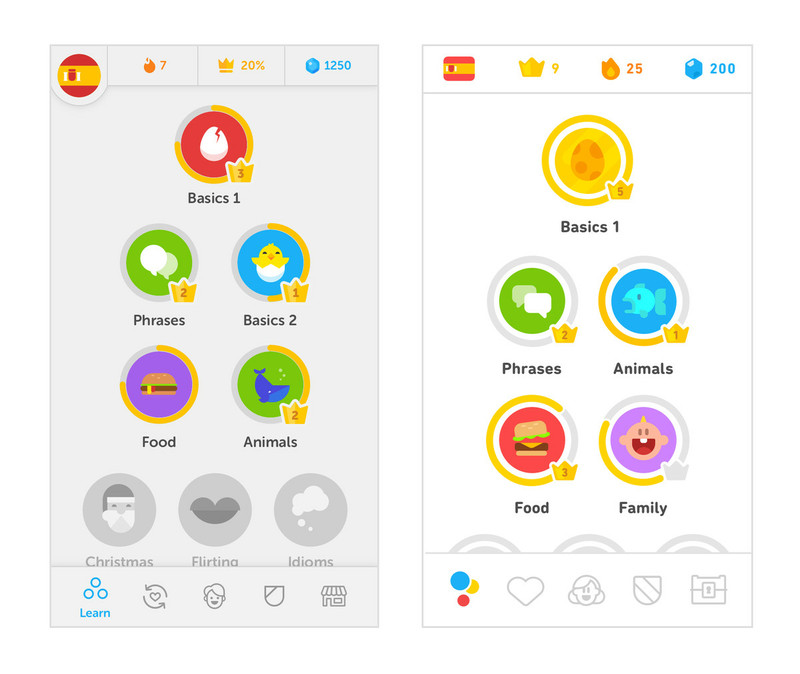 Duolingo wanted the app to feel even more like a game, says Tyler Murphy, the company’s head of design. Gamification has always been a big part of the app, which incorporates Zelda-inspired heart bars to raise the stakes for getting answers correct and “streak counts” to keep users coming back to the app every day. 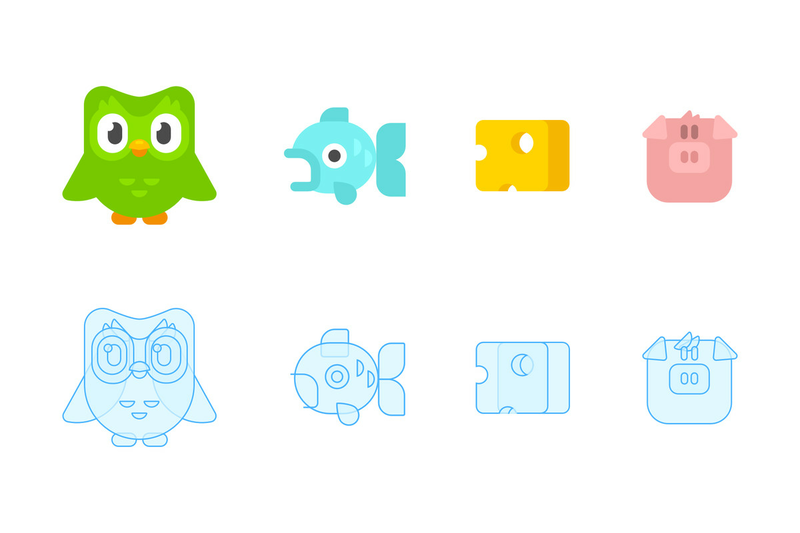 With the redesign, Duo is being turned into the app’s answer to gaming mascots like Mario. “Games have this unique ability where you get really attached to their character. That’s why they can keep releasing new games with that same character, and people will rush out to buy them,” he says. Murphy contrasts that with an app like Twitter, whose bird icon always looks the same. “Games usually have an icon like Mario, who’s always appearing in different positions and with different facial expressions.” Even Duolingo’s app icon, an extreme close-up of the owl’s face, makes you think of a mobile game icon, like Super Mario Run. “That’s one of the reasons why we decided to give him so many other sides,” he says. It’s a strategy that’s paid off so far, and one that the team is betting on again for its redesign. “We definitely have seen that our users are attached to Duo. We would show him crying, and I think that one had the most profound effect on people,” Murphy says. Users are attached enough to the mascot to wonder about its origins, with discussions in the Duolingo forums joking about owls being a symbol of the Illuminati. It’s no conspiracy, though. 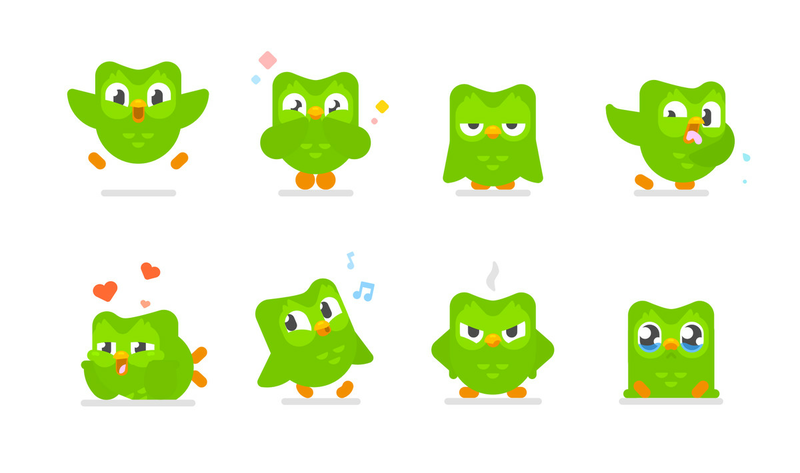 Duo is an owl because owls represent knowledge, and it’s green because of an inside joke meant to troll Duolingo co-founder Severin Hacker. When the team was first deciding on a mascot, his only guidance to designers was that he hated the color green. “We thought it would be funny to make the owl green just to mess with him. And so he’s had to stick with a green owl now as the mascot for his company for several years,” von Ahn says. It’s a surprisingly straightforward origin story, especially for a company that’s constantly tweaking details, experimenting, and shifting. Before co-founding Duolingo, von Ahn was a computer researcher who invented the CAPTCHA, the challenge-response authentication tool that has users type in wobbly words to check that they’re not bots. After realizing the number of hours wasted on typing in CAPTCHAs (it takes about 10 seconds for one person to input a CAPTCHA, and with the process used by approximately 200 million people around the world every day, that adds up to around 550,000 hours a day), he subsequently created reCAPTCHA, a process for digitizing books too illegible to be scanned by computers. As of 2011, reCAPTCHA has completely digitized the archives of The New York Times and Google Books. von Ahn applied the same logic to Duolingo in its early stages, by crowdsourcing translations from users as they learned new languages. The program eventually evolved into a feature that allowed users to practice translating BuzzFeed and CNN articles, but was removed after the company decided to concentrate on “just language learning, as opposed to language translation.” It has now shifted its monetization strategy toward Duolingo Plus, the company’s ad-free paid version, and the Duolingo Test Center, which offers English-language proficiency certificates. A small number of users have had the redesign for a few weeks, and Murphy says that the new illustrations and animations have made an impact. There’s been a small increase in the number of lessons taken, and an uptick in subscriptions to Duolingo Plus. Still, true to the experimental nature of the company, the team wants to see long-term effects as the changes roll out to more people today. “Everything we do is a test, every change we make. So, for example, this whole redesign is a test,” says von Ahn. Currently, the app offers 37 languages, including Navajo, Indonesian, and Hawaiian in beta, and “constructed” (not “made-up,” von Ahn points out to me) languages like Klingon. The widely requested Arabic is on its way, set to arrive in May 2019. There’s also recently added Asian languages like Japanese, Chinese, and Korean, which are exempt from the hearts system, as they’re much harder to learn and can be too frustrating for users.